The J. Lizars company was founded in 1830 by the optician John Lizars (1810-1879) in Glasgow, Scotland. After he died the company was taken over by Michael Ballantine, but continued under the same name, making eyeglasses, telescopes, microscopes, barometers, thermometers, magic lanterns and slides, cameras, stereo cameras and viewers and binoculars. The company later passed to Robert Ballantine, and then to Michael and Arthur Ballantine, both sons of Michael Ballantine senior. 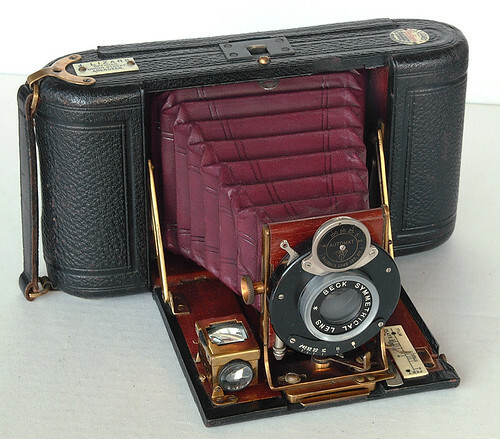 The range of Challenge folding cameras was innovative. Notes on the company at Early Photography state that by the end of the First World War the company had ceased to design and build its own cameras; it continued to sell cameras by other makers under its own brand; however, the Ballantines took out at least three patents relating to design of smaller folding cameras in 1919-20, and a camera implementing the patented features was advertised. In 1913 the firm had branch offices in Edinburgh, Paisley, Greenock, Aberdeen, Liverpool and Belfast. A 1916 BJA advertisement gives the factory address as: Golden Acre Works, Craignestock Street, Glasgow. Lizars merged with C. Jeffrey Black to form Black & Lizars in 1999. That company still operates primarily as a retail chain of opticians in Scotland and Northern Ireland, but the Belfast branch still deals in photographic equipment. ↑ British Patent 139246 (submitted 2 July 1919, granted 4 March 1920), Improvements in photographic cameras, granted to Arthur Ballantine, Robert Stanley Ballantine, and William Watson (not Watson of Holborn), describing a set of moveable rollers in a camera back, which allow a loaded roll film to be moved out of the way for insertion of a plate-holder, such that the plane of focus remains the same, whether a roll film or a plate is used. The lens position need not be adjustable, as needed for many film/plate cameras. The patent states that the Ballantines trading as Lizars and William Watson, a scientific instrument maker, both traded from the same Glasgow address. ↑ British Patent 140858 (submitted 2 January 1919, granted 6 April 1920), Improvements in photographic cameras, granted to Arthur and Robert Ballantine and William Watson, describing the construction of roll-film camera bodies from aluminium castings covered with light aluminium sheet bodywork. ↑ British Patent 144390 (submitted 12 March 1919, granted 14 June 1920), Improvements in and relating to lens adjusting means for folding photographic cameras, granted to Arthur and Robert Ballantine and William Watson, describing a design for the focus mechanism on the folding bed of a camera, which engages with the lens carriage when this is pulled out of the body, automatically giving correct registration with a focus scale (such a mechanism (arranged as a radial focus lever) though not designed to this patent, is provided on the Zeiss Bobette II illustrated in the article on bellows, and on some models of the Ernemann Bob). ↑ 1919 advertisement for a Challenge camera for 2¼x3¼-inch exposures on roll film or 2½x3½-inch plates, at edinphoto.org.uk. 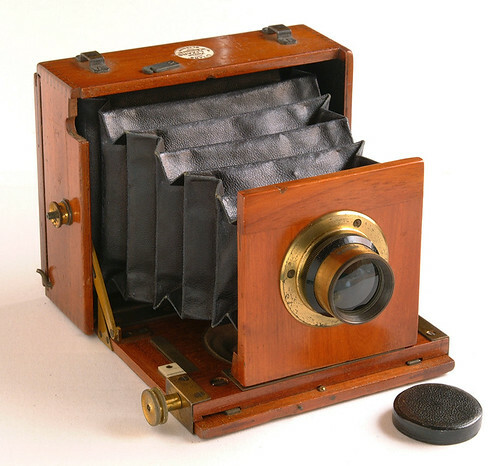 The camera is of aluminium construction, as in Patent 140858, and the roll film and plates are exchangeable using the roller mechanism in Patent 139246. The camera illustrated certainly has a radial focusing lever, so may also implement Patent 144390. 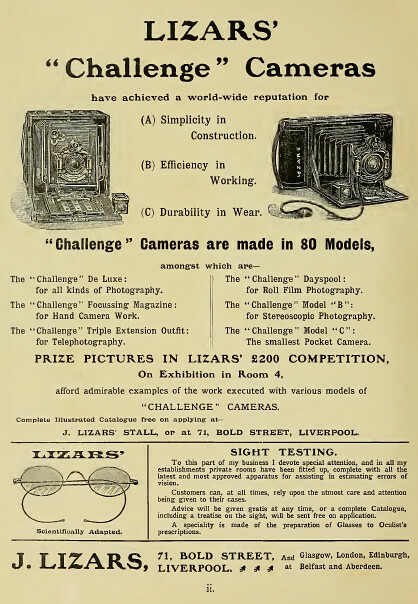 ↑ Lizars advertisement from page ii of Northern Photographic Exhibition: catalogue of an exhibition held at the Walker Art Gallery, Liverpool, 22 March-13 April 1907, by the Liverpool Amateur Photographic Association, Manchester Amateur Photographic Association and the Leeds Camera Club; available to view or download in various formats including PDF at the Internet Archive; supplied by the Research Library of the Getty Research Institute. British Patent 5926 of 1906, Improvements in and relating to Means for Carrying and Exposing Dry Sensitive Photographic Plates or Films in the Camera, granted to Robert, Arthur and Hew Ballantine and John Linstrum, and describing a holder for a plate or sheet of film, comprising two paper envelopes inserted one inside the other, as an alternative to conventional plate-holders. The film-holder has narrow tabs at each side which are pulled out to open the film to exposure, instead of a full-height dark-slide. Linstrum is described as a camera maker, and the Ballantines as opticians. All were at Glasgow addresses; the Ballantines at 101 Buchanan Street, which is among Lizars' addresses (as on the Victor camera illustrated here), but Lizars is not mentioned in the patent. British Patent 4231 of 1911, An Automatic Projecting Lantern, granted to John Lizars and Joe Quiggley, describing an electrically-driven slide-changer for projectors. The changer holds ten slides, and incorporates a shutter to cut off the projector lamp during the changes. This page was last edited on 7 March 2018, at 06:15.